All transactions are safe and secure with a reliable history in online purchasing behind each of our associates. Buy the Game of Death t-shirt to own Bruce Lee clothing and merchandise. 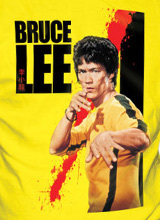 This yellow Game of Death tee features Bruce in a fighting pose dressed in his familiar yellow and black costume. The style of his outfit was also replicated for Uma Thurman's Kill Bill costume. Whether you dream of attending a former Bruce Lee Jeet Kune Do school to learn The Way of the Intercepting Fist, or you're just a fan of the classic movies, this piece of apparel is the perfect tribute. Pair it with a Jeet Kune Do Bruce Lee shirt. Check out the Bruce Lee hats as well. In addition to the Game of Death tee above, browse the Bruce Lee Clothing Gallery for more apparel like men's and women's clothes, kids shirts or hoodies.